We are the leading manufacturer & exporter of Guard Rail. These barriers ensure that no damage is dome to the vehicles and the occupants. 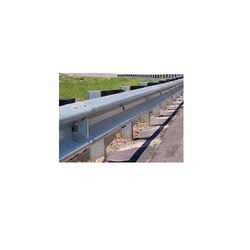 We are the leading manufacturer and exporter of Guard Rail. The basic function of Guard Rails is to absorb the impact energy of the colliding vehicle thus minimizing the extent of risk and damage to the vehicle and its passengers. Standard quality of Guard Rail is offered by us and is highly tested for their quality before dispatched in the market.